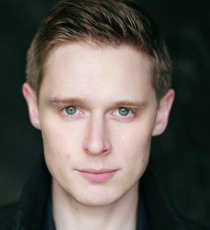 Samuel Barnett is a stage and screen actor, best known for appearing in the original stage production of The History Boys and the subsequent 2006 film. His recent stage credits include Alleluja! at the Bridge Theatre. His television credits include roles such as Daniel Stroud in Twenty Twelve and John Millais in Desperate Romantics. He has also appeared in television show Penny Dreadful and currently starring as the title role in the BBC America series Dirk Gently.